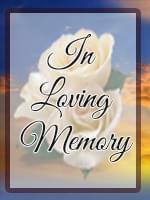 Rita MacDonald Rousseau Noble of Mesa, AZ; passed away Saturday, January 30, 2010. She was born at CMG Hospital in Lewiston, Maine on December 27, 1918. She lived most of her life in Maine and then retired to Mesa, AZ. She was twice married, Amedee Silvio Rousseau and Harold Noble, both deceased. Survivors include 2 sons: Richard (Sylvia), John (Jonie); 1 daughter: Carmen Rousseau; grandchildren: Thaddus & Timothy Campbell, Christopher Rousseau, Natalie Mullis, & Emily Rousseau; several great grandchildren; & 3 great great grandchildren. Rita leaves a beloved sister: Doris MacDonald Laplante. Memorial services were held at 2:00 pm, Wednesday, February 3, 2010 at A Wise Choice Desert View Chapel, 9702 E. Apache Trail in Mesa, AZ. May you find comfort in the fond memories of her and may God give you all the strength to endure this time of sorrow. Remember and rejoice in God’s promises in the scriptures to obedient mankind who have fallen asleep in death at Acts 24:15, there will be a resurrection of the righteous and the unrighteous. In addition, very soon pain, sickness, poverty, and death will be no more as mentioned in Revelation 21:1-5. My sincere condolences to the family.